GARR is the ultra-broadband network dedicated to the Italian research and education community. Its main objective is to provide high-performance connectivity and to develop innovative services for the daily activities of researchers, professors and students as well as for international collaboration. GARR network is designed and managed by Consortium GARR, a non-profit association founded under the auspices of the Ministry of Education, University and Research. The founding members are CNR, ENEA, INFN e CRUI Foundation, representing all Italian universities. GARR network is an extensive digital infrastructure with about 15.000 km of optical fibre covering the entire national territory. It reaches about 4 million users and connects more than 1.000 sites, most of which are public institutions (research institutes, universities, research hospitals, cultural institutes, libraries, museums, schools). GARR network is interconnected with international research networks and the worldwide Internet, so regardless of the geographic location, any researcher can exchange digital data and content, use scientific computing resources and cloud-based applications. To best meet the most specific requirements of the education, research and culture community, GARR is able to design custom network solutions and services. GARR network is unique and differs from commercial providers not only in its institutional nature, but also for its extremely high transmission capacity (from 100 Mbps to 100 Gbps) in both download and upload. 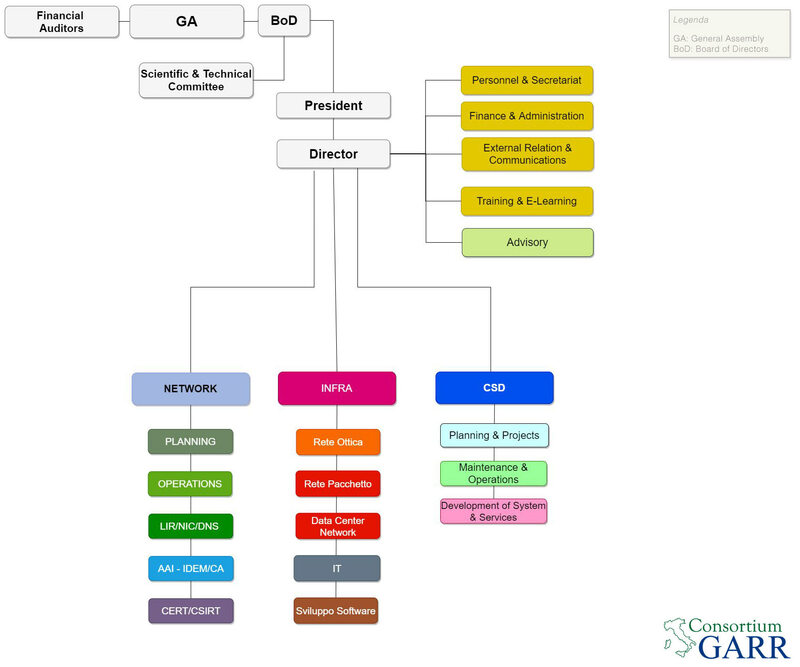 GARR governance model promotes inclusiveness and involves users in decision-making on the future evolution of the network and digital infrastructures. Unlike with commercial providers, users on GARR network aren't just consumers of data, content and services; they can also share their own resources for the benefit of the scientific community, thus becoming active contributors. Thanks to an extensive system of interconnections with other national research networks and the interoperability of protocols and services, Italian researchers can collaborate with partners around the world. GARR, in fact, has always been an integral part of the European research network GÉANT, which it owns together with the other European NRENs. GARR is also connected to the main global research networks and international bodies that develop and govern international infrastructures, such as the IETF, the Internet Society and e-IRG. The international outlook is one of the elements that distinguish the work of European NRENs (National Research and Education Networks) like GARR when compared to commercial providers. The NRENs are in fact International network, working together on research and development projects. Thus it is possible to offer common services and end-to-end connections on a global scale, a crucial aspect for research communities, which are increasingly committed to international collaborations. This is guaranteed by GARR's membership in GÉANT, which manages the European research backbone, and in RIPE (Réseaux IP Européens), and its participation in the work of IETF and the Internet Society - Italy Chapter, as well as an extensive network of bilateral relations with European and global research networks.